The level editor was designed and implemented by Nora and was added in after the beta release. The level editor is a tool that we will use to build our levels and save to xml. It allows us to drag and drop objects onto the screen as well as resize them so that we can efficiently design our levels. The level editor will not be included in the final release so it is for our own purposes only. Format: All the buttons are laid out on the bottom of the screen. The pictures indicate what object each button corresponds to. To place an object onto the canvas, click a button and then click the position on the screen at which you want to place the object. Re-positioning: To re-position the objects simply click and drag an item that is already on the canvas. A yellow box will appear in the middle of the object, signifying that you have selected it. Re-sizing: To re-size objects that are resizable, click the top right corner of the object and drag it to the desired size. Deleting: Select an object and click the delete button located in the button panel. Currents: Currents are placed like normal objects. To specify which direction the current flows, select the current and toggle the direction with the arrow keys. Rotating Planks: To place rotating planks, click first where you want the hinge to be and then drag out to where you want the plank to extend. Then click the plank and use the left and right arrow keys to specify a minimum and maximum rotation angle for the plank. Rooms: To create a new room, click the 'R' button on the screen and a blank room will appear. To toggle in between rooms use click the up and down buttons that are located in the button panel of the level editor. Whirpools (Portals): Portals are placed like normal objects. To specify the portal partner, click the protal and use the arrow keys to specify a partner. Each portal that is already placed will have a designating number to indicate which portal partner you are selecting. To save, click the 'S' button on the bottom panel. This will bring up a list of any objects you forgot to place. (There are required objects such as a Nina, and a home). 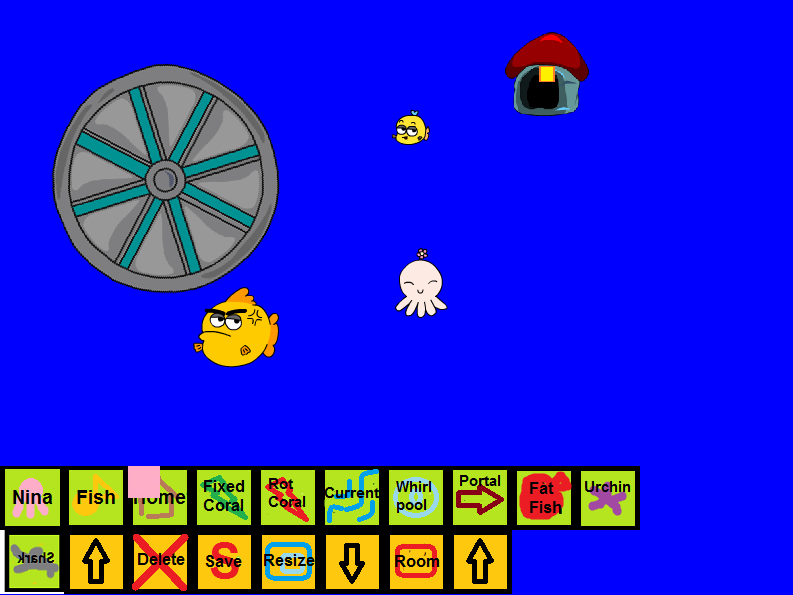 Also, this will prompt you for a number of fish that need to be rescued to complete the level. You can toggle this value using the up and down keys. 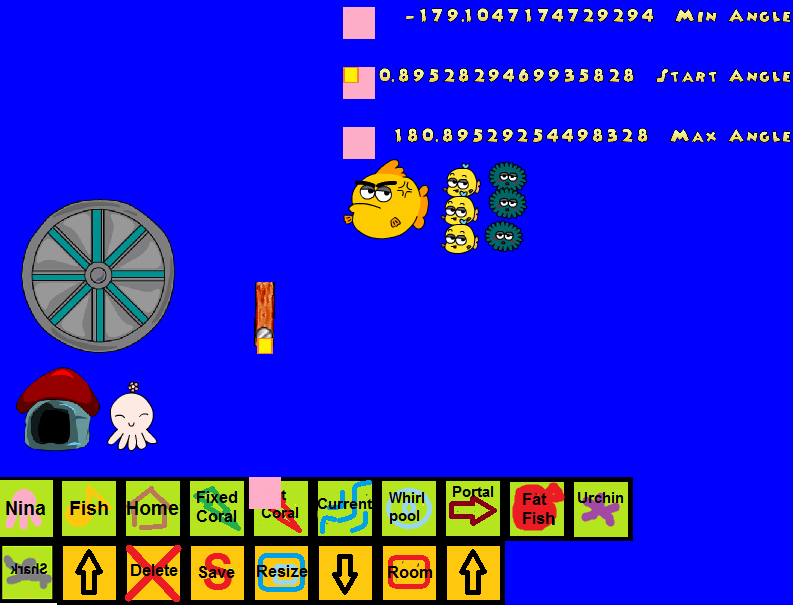 It will only go up to as many fish as you place on the canvas. Once you are done with these steps, click the 'S' button again and the xml will be generated.